1. 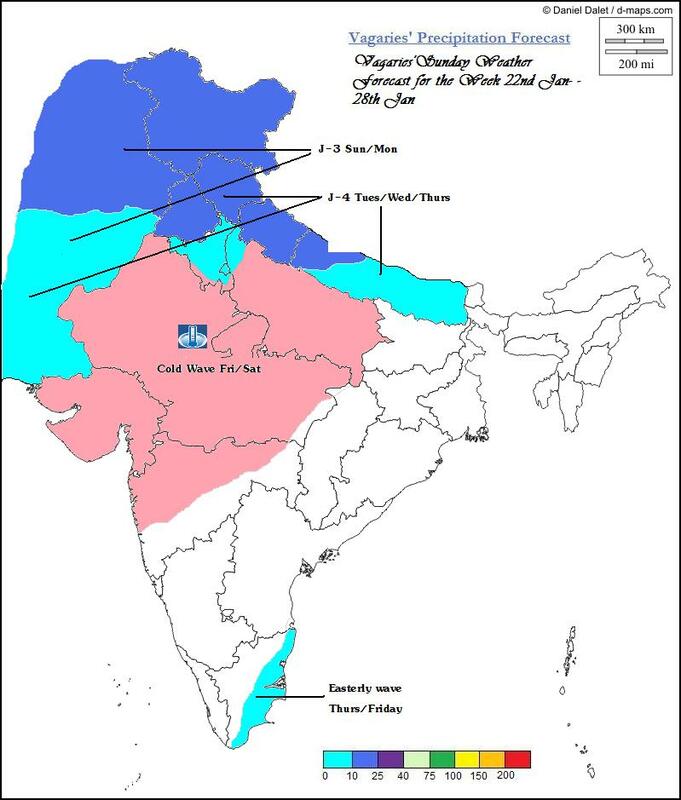 J-3 will precipitate rain/snow over Northern states of Kashmir and H.P. and Northern regions of Pakistan on Sunday. Light rains will also occur in coastal Sindh and upper Sindh on Sunday. Light penetration of J-3 into Western regions of Nepal on Monday. 2.J-4, will bring light rains to coastal Sindh on Tuesday,24th. Rain/snow to Kashmir, H.P, moderate rains to Punjab (both) and Haryana and light rains in Delhi on Wednesday and Thursday, 25th and 26th.Southern regions below Delhi latitude in India will be dry. J-4 moves into entire Nepal on 27th, but holding medium strength.Eastern India will be dry in the week. 3. Dubai gets rains with strong winds on Monday, 23rd. 4. A weakish Easterly wave, remanant of a low in the far east, will bring light rains to coastal T.N. on Thursday and Friday. Some rains move inland into T.N. on Friday, 27th. Mumbai: Sunday will be windy with sharp West winds, bringing in possibility of some clouding. Clear from Monday, as winds turn NW.Cooler week days with temperatures at night hovering around 15/16c (S'Cruz). However, a slight fall to 13/14c expected on the latter part of the week, from Thursday/Friday. Delhi: Lows will be maintained around 5/6c till Wednesday, thanks to J-3. Thursday and Friday brings J-4, and will be partly cloudy with light rains in parts of NCR. Hence, naturally a rise in night temperatures. Republic day could be free from fog, and comfortable. Night temperatures are slated to fall from Friday 27th. Kolkata: Almost constant weather Sunday thru Thursday. Clear with the tem range between 26c and 13. Cloudy on Friday with light rain by Saturday, 28th. (J-4 remnant effect). Rise in night temperatures from Thursday, going to 19c on Saturday, 27th. Karachi: Light rains ceasing after Sunday. Night temperatures, around 15c till mid week. Sukkur, will get light rains on Sunday, and, again some light precipitation on Tuesday (J-4). Temperatures around 9/10c till Tuesday, could also fall to 6c from Wednesday. Last week's Weekly forecast put up on Sunday last had all the six (6) points accurately predicted.almost 95% accurate.